SPOKANE, Wash. (AP) - After a long legal fight, a giant truckload of oil refinery equipment began its lumbering journey late Tuesday onto scenic U.S. Highway 12 - the first of what environmentalists fear could be hundreds of truckloads moving along a federally protected route once crossed by Lewis and Clark. Four so-called megaloads have been approved to leave the Port of Lewiston in Idaho in the next three months, each carrying half of a 300-ton coke drum headed to a ConocoPhillips refinery in Billings, Mont. Locals tried to stop the shipments, worried they could open the gates to turning the designated scenic byway into an industrial corridor. They contend the loads will hurt tourism, delay emergency responders and could damage the fragile ecosystem adjacent to the narrow, winding mountain highway between the Port of Lewiston and the Montana border. "Citizens pleas for common sense and for the protection of the highway and the river corridors have fallen on deaf ears," said Kevin Lewis of Idaho Rivers United, a group that spoke out against the shipments. 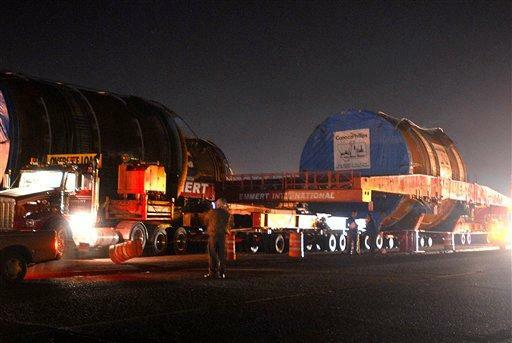 Opponents vowed to shadow the first load, which can travel only at night. But ConocoPhillips spokesman Bill Stephens said Tuesday night that no demonstrators were present when the big rig left, and that the journey "went off just as planned." The truckloads needed special permits from the state because they are three stories tall, 226 feet long, and will take up both lanes of the highway during their four-day journey to the Montana border. The coke drums are bound for a refinery in Billings, where they use heat and pressure to convert crude oil into petroleum products, and the company has been planning the shipments for years, said spokesman John Roper in Houston. "We are solely focused on getting our shipments rolling and getting them safely to Billings," Roper said. The shipment followed months of legal challenges over the Idaho Transportation Department's initial decision to permit the oversized loads. In January, Idaho Transportation Director Brian Ness agreed to issue the permits for the 175-mile journey across Idaho. The refinery equipment was made in South Korea, shipped to the Northwest and then barged up the Columbia and Snake rivers to the Port of Lewiston, the most inland on the West Coast. The first load will be joined by a second near Lolo Pass, which is part of both the Lewis and Clark and Nez Perce national historic trails. There, the two loads will start a 14-day trip across Montana, beginning Feb. 10 and covering 172 miles from start to finish. The big rigs are authorized to travel from 10 p.m. to 5:30 a.m. in Idaho, and midnight to 6 a.m. in Montana. They would be parked at roadside turnouts during the day. In Montana, traffic can be delayed for no more than 10 minutes. In Idaho, delays of up to 15 minutes are allowed. Opponents complained that those delays were a rolling roadblock. They said the shipments also could damage the environment along the scenic highway, including the Clearwater and Lochsa rivers, part of the federal Wild and Scenic rivers program. Each load will be accompanied by about 30 workers. On tight corners, workers will walk on the roadway and slowly ease the loads around rock faces. Idaho-based Advocates for the West and Montana-based All Against the Hall said they planned to protest the passing loads, but would not try to block the shipments. "We intend to monitor the shipments to see if they comply with the requirements of the permits," said Linwood Laughy of Kooskia, one of the people who filed the legal challenge to the permits. Opponents have turned their attention to a separate request by ExxonMobil to begin shipping more than 200 oversized loads along the same highway into Montana, then north to the tar sands of Alberta, Canada. ExxonMobil has already delivered more than a dozen massive modules of refinery machinery to the port in Lewiston. If those shipments are approved by the states, trucks could roll down Highway 12 five nights a week for a year. Lewis, of Idaho Rivers United, said shipments of such frequency would destroy the values that led former Idaho Sen. Frank Church to include the Lochsa and Clearwater rivers among the original eight Wild and Scenic Rivers more than four decades ago. "The pristine waters of the Clearwater and Lochsa are vital habitat for salmon and (endangered) steelhead and bull trout," Lewis said. "They are home to rare Harlequin ducks and provide a wide-range of recreational opportunities for Idahoans and visitors from out of the area." "Allowing these ConocoPhillips loads to proceed is unfortunate. But allowing the 200 plus ExxonMobil loads and the others we expect to follow would be a tragedy," he said.